REDWOOD CITY, Calif. – August 16, 2017 – The capacity for private data exchange between businesses is projected to outpace the public Internet, growing at nearly twice the rate and comprising nearly six times the volume of global IP traffic by 2020, according to the Global Interconnection Index, a new market study published by Equinix that analyzed the adoption profile of thousands of carrier-neutral colocation data center providers and ecosystem participants globally. As business models become increasingly digital, distributed and dependent on the real-time engagement of many more users, partners and service providers, the Index is a powerful new research tool. It highlights how companies are translating digital transformation into action and creating entirely new ways of connecting with their customers, partners and supply chain. The Index will provide an annual baseline to track, measure and forecast the growth of Interconnection Bandwidth, defined as the total capacity provisioned to privately and directly exchange traffic with a diverse set of counterparties and providers at distributed IT exchange points. 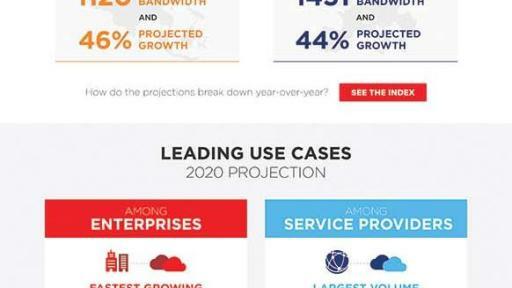 According to the Index, Interconnection Bandwidth is expected to grow at a 45 percent CAGR to reach 5,000 Tbps by 2020, dwarfing Global IP traffic in both growth (24 percent) and volume (855 Tbps)1. It is also expected to grow faster than Multiprotocol Label Switching (MPLS), the legacy model of business connectivity, by a factor of 10x (45 percent to four percent)2. Digital Technology Use, which forces the need to support real-time interactions requiring more Interconnection Bandwidth. According to Accenture, digital technology use is projected to add $1.36 trillion in additional economic output in the world’s top 10 economies by 20203. Urbanization, which is transforming global demographics and creating a proximity need for digital services concentrated across metro centers globally. More than two billion people are expected to migrate to major cites by 2035, creating as many as 50 major urban metro hubs4 requiring dense Interconnection fabrics. Cybersecurity Risk, which expands Interconnection consumption as firms increasingly shift to private data traffic exchange to bypass the public Internet and mitigate against digital threats. By 2020, an estimated 60 percent of digital businesses will suffer major service failures5 as breaches permeate across physical and digital platforms. Global Trade of Digitally Deliverable Services, which ushers in a new era of dynamic business processes and demand for Interconnection. Global digital workflows require a global mesh of Interconnected metros to fulfill demand. According to McKinsey6, trade in digitally deliverable services now comprises 50 percent of total services exports globally, with an expected 9x increase by 2020. As crucial as Interconnection is to how digital business is conducted, it has never been quantified. The Global Interconnection Index changes this with industry-first projections of how Interconnection growth and access will unfold through 2020. This in-depth view arms businesses with the data-driven insight they need to consider their own Interconnection strategy for digital business success. For the first time, organizations can see multi-dimensional projections of Interconnection Bandwidth requirements by region, industry, use case, firmographics and maturity model. The Global Interconnection Index was developed by creating a market baseline that analyzed the deployment profile of thousands of carrier-neutral colocation data center providers and the participants deployed within them globally across every region and major metro. This data was combined with local and regional market data (including macroeconomic trends, market demographics and industry concentrations), and with key demand drivers of digital business, to form a weighted demand multiplier to assist in predicting growth to factor the impact of digital business transformation. A detailed methodology description is included in the Global Interconnection Index. This press release contains forward-looking statements that involve risks and uncertainties. Actual results may differ materially from expectations discussed in such forward-looking statements. Factors that might cause such differences include, but are not limited to the risks described from time to time in Equinix’s filings with the Securities and Exchange Commission. In particular, see Equinix’s recent quarterly and annual reports filed with the Securities and Exchange Commission, copies of which are available upon request from Equinix. Equinix does not assume any obligation to update the forward-looking information contained in this press release.